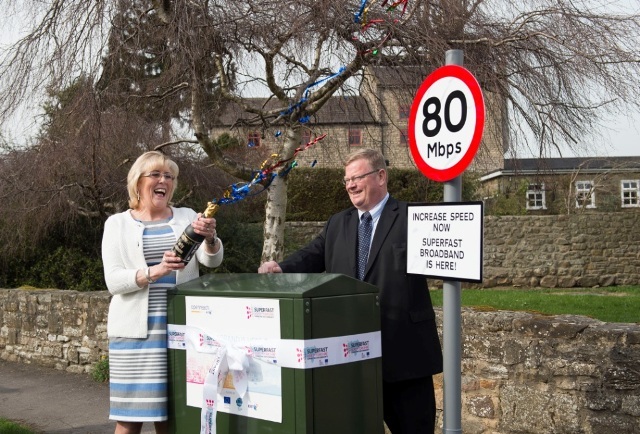 Superfast North Yorkshire celebrated the completion of the first phase of its superfast broadband rollout programme with the ceremonial switching on of a fibre broadband cabinet in Masham. The new fibre cabinet is the 1000th to be installed across the county Number includes both commercial and SFNY cabinets deployed across the county. – and is one of four cabinets that will be providing access to high speed broadband for more than 800 homes and businesses in the small market town. It means that nearly 90 per cent of the county’s 380,000 premises can now get high speed broadband – offering speeds of up to 80Mbps and beyond* – when BT’s commercial roll-out of fibre broadband is also taken into account. Work is already underway on the next phase of the Superfast North Yorkshire project with £8 million in additional funding to make high speed broadband available to another 11,100 homes and businesses in 2017. Details of where the first 6,500 of these premises are located will be loaded onto the SFNY website in the coming weeks. High Quality broadband provides more than 10Mbps download speed which, while not reaching superfast broadband speeds, may be able to give a much better service for premises in locations where SFNY has not yet been able, within the funding available, to provide superfast broadband. Scott Walters, chief executive of SFNY, said: “The completion of the main part of the Superfast North Yorkshire project is fantastic news and means that hundreds of thousands of homes and businesses who were previously beyond the reach of fibre, can now enjoy the numerous benefits of high speed broadband. Since work began on the Superfast North Yorkshire project in 2012, engineers from BT’s local network business, Openreach, have enabled 149 exchanges, and installed 10,000 kilometres of fibre optic cable – enough to stretch from York to Tokyo. People across the county have been embracing the broadband revolution with some of the highest take-up figures in the UK. More than 34,000 homes and businesses within the project area have so far signed up to a high-speed broadband service. Masham is the latest of around 700 towns and villages that have been connected with fibre since the village of Ainderby Steeple became the first community to benefit from the Superfast North Yorkshire project in December 2012. One Masham resident celebrating the arrival of superfast is Sue Burrell who runs the Millgate Bed and Breakfast, recently rated best in the world, according to TripAdvisor’s Travellers’ Choice awards. TripAdvisor Traveller’s Choice Number 1 B&B in the World 2015. The accolade has meant the Millgate’s bookings have gone through the roof – leaving them full for most of 2015 and up to September 2016. But owner Sue Burrell says the key to staying on top is having superfast broadband. Sue said: “One of the things you are now assessed on by websites like Booking.com is the quality of the broadband available to guests. Not being able to offer a good quality broadband connection could see our rating drop. These days it is seen as an essential, especially among the younger guests – it is the first thing they ask about. Bill Murphy, BT’s managing director of next generation access, said: “The announcement is a great achievement, particularly with all the challenges that rolling out a fibre network in such a rural and remotely populated county like North Yorkshire brings. “Small enterprises like the Millgate B&B form a key part of the local economy in rural areas. For them, faster broadband is essential. The Superfast North Yorkshire project was the first in the UK to deploy fibre broadband using Broadband Delivery UK (BDUK) funds following the signing of a £36.4m contract led by North Yorkshire County Council and BT in July 2012. The pioneering project was also the first in the North of England to deploy microwave radio technology designed to extend the reach of fibre – linking up the remote village of Westow. In another technology first, the village of Ulshaw was enabled with fibre using Fibre to the Remote Node technology, designed to bring superfast broadband to remote and challenging areas. The deployment of fibre broadband by the Superfast North Yorkshire project is in addition to more than 200,000 North Yorkshire properties able to access fibre as a result of BT’s £2.5 billion commercial roll-out programme across the UK.